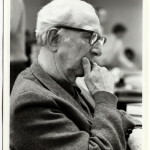 An archive of Sittler’s writings, sermons, and recordings of lectures and speeches was established at LSTC in 1997 (www.josephsittler.org). Last October, 25 years after his death, a symposium was held in Chicago to celebrate his legacy. Colleagues and students shared anecdotes about Sittler, considered his influence on their thinking and ministry, and along with young scholars who have recently discovered Sittler’s theology reflected on its continuing significance for today’s debates on ecology, Christology, scripture, aesthetics, and ethics, to name but a few of the topics that his writings address with remarkable acumen and surprising contemporary relevance. This issue of Let’s Talk brings together a broad spectrum of contributors. Two younger theologians, Rob Saler and Panu Pihkala, provide critical perspectives on Sittler’s theological legacy. Colleague Martin Marty offers a lively and insightful remembrance of Sittler the Div School professor. Lifelong friend Melvin George, who with his wife Meta established the Sittler Archives, writes about the mission of the Archives and hopes for their service to future church leaders and theologians. Students Frank Senn and Wayne Miller reflect on the significance of this teacher and mentor for their own theological journeys. Homiletical scholar Melinda Quivik helps us to appreciate Sittler the preacher with a review of the new collection The Eloquence of Grace: Joseph Sittler and the Preaching Life (ed. James M. Childs Jr. and Richard Lischer). Finally Sittler Archivist Matt Frost shares several previously unpublished essays (1957-1981) and sermons (1935-1945) from the Archives, here reproduced as facsimiles to allow the reader the insights and sense of connectedness that come from seeing the documents as they are. Joseph Sittler brought an attentive ear and insightful critique to the church’s proclamation of the Gospel. His was “concrete theology” seeking to explicate God in the particulars; his theological drive was deeply grounded in the moment, in the struggles and passions of mid- to late 20th-century life. Yet now, at a rather different moment, we may be surprised to discover that his voice is by no means irrelevant or inconsequential. Theologians, church leaders, and pastors are invited to pay attention to this remarkable servant of Christ.